Heavy rains and high flows in the Arroyo Las Posas, near Moorpark, California, eroded away an approximately 500 foot section of the northern bank of the Arroyo in the winter of 2005. The resulting vertical banks were as high as 45 feet in some sections and the top of the banks were located just feet from historic farm outbuildings. 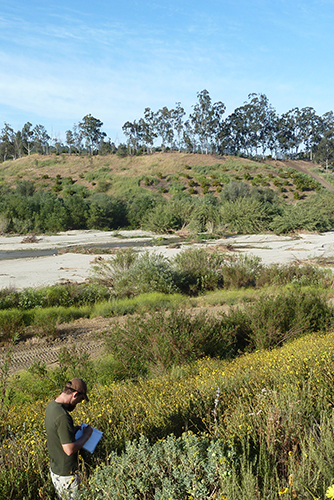 Aspen Environmental Group biologists assisted the landowners in completing the regulatory permitting process with the California Department of Fish and Game, US Army Corps of Engineers, Los Angeles Regional Water Quality Control Board, and Ventura County Watershed Protection District. Additionally, Aspen biologists assisted the landowners with the implantation of restoration activities, monitored all restoration areas, and prepared annual regulatory agency reports until the completion of the project in February 2012.